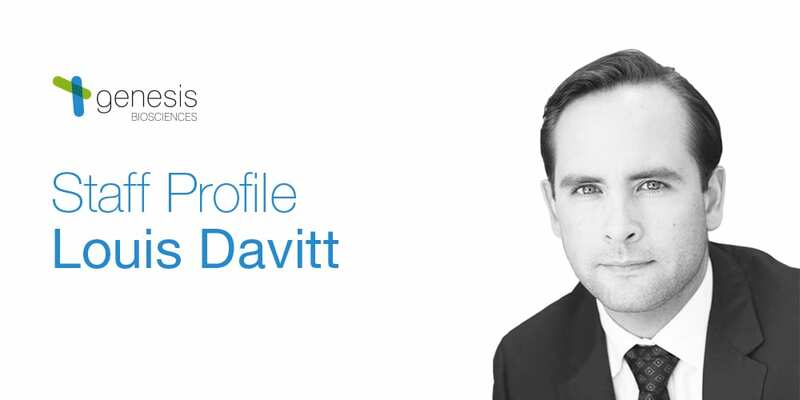 As our Fermentation Manager, Louis Davitt makes sure our fermentation processes are scientifically sound, closely monitored and thoroughly documented. Alongside his important duties as a member of our elite management team, our Fermentation Manager Louis focuses on innovation and new ideas for the company. Leading the fermentation team, Louis directs all fermentation processes, new strain discovery and optimization, and microbial product improvement to ensure our company is constantly striving for scientific greatness. I am the Fermentation Manager at Genesis and that role tends to be involved in many projects. I manage the bacteria from laboratory testing through to final spray drying and everything in between. 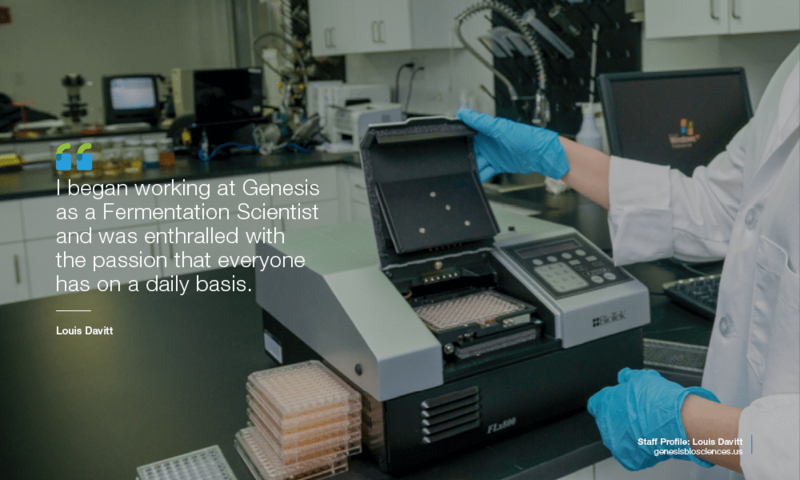 I began working at Genesis as a Fermentation Scientist and was enthralled with the passion that everyone has on a daily basis. This is not a typical 9-5 job and you need committed team members to put out the best product. Over the years we have added more technology, as well as more great minds and that has made coming to work even more enjoyable. What’s one thing that drives you in your work? I have a personal challenge to make the company even better than it was the day before. Whether it’s formulating projects, working with the sales team, or improving the fermentation – there is an opportunity to make something better. What’s the best thing about working as Fermentation Manager at Genesis? The skilled and knowledgable people I work with every day make it the most enjoyable experience. We strategize and plan on projects that affect the world and there is a strong team commitment to put out the best products possible. What does your typical day include? My typical work day is different than most. I enjoy being hands-on with the process and teaching our scientists different ways to approach challenges. I usually spend my time 50/50 working with the floor operators and our lab. The most challenging part of the industry is overcoming the fear of using bacteria as a cleaning solution. Meeting with customers, explaining the testing and research, then showing proven results of our formulations usually convinces them. Be humble. Be hungry. Always be the hardest worker in the room. Our bacteria is tested over years to make sure it will still be safe and still effective when put to use. Our greatest achievement so far is bringing together a team that all have the same expectations and passion to achieve the best results possible. 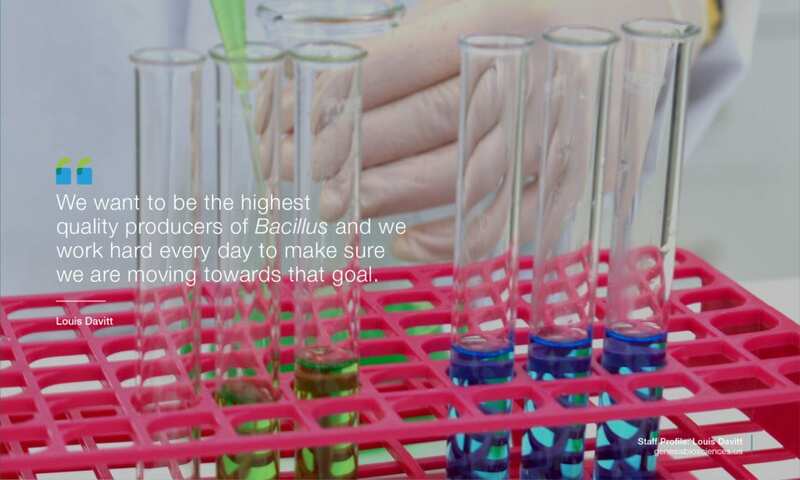 We want to be the highest quality producers of Bacillus and we work hard everyday to make sure we are moving towards that goal. We are working on some very exciting, world changing products here at Genesis. I don’t know what is next for me, but with the team we have assembled here at Genesis I don’t see a limit to the possibilities we can accomplish! 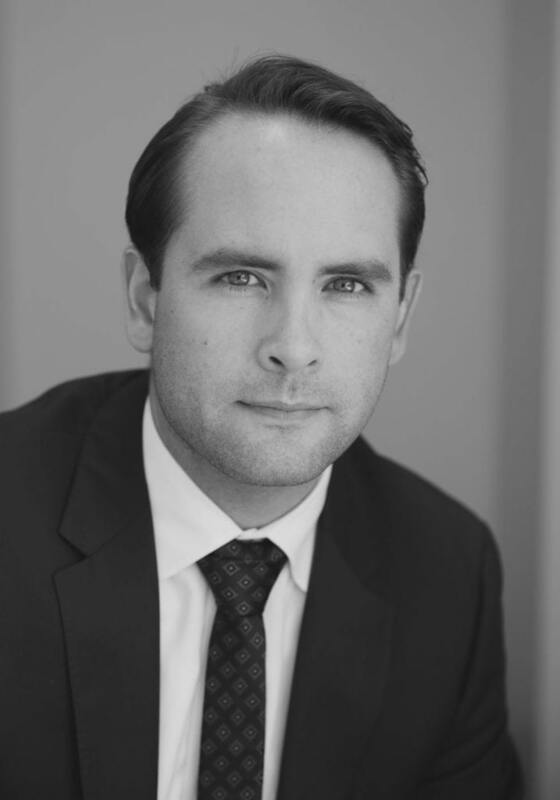 To find out more about the work of Louis and Genesis Biosciences, visit our About page.